Time for another wish list post! I thought we all need a new dose of colours in our life. As you know, I always loved rainbows, not just since what happened in Orlando, not only at Gay Parade and not just after I discovered how many narrow-minded and intolerant people we have in the world. Therefore, this wishlist is bright and packed with all colours; this is what the world needs more! I wholeheartedly agree with all the rainbow stands for as a symbol: Yes to peace, yes to diversity and another yes to equal rights for everybody, no matter what gender or sexual orientation! 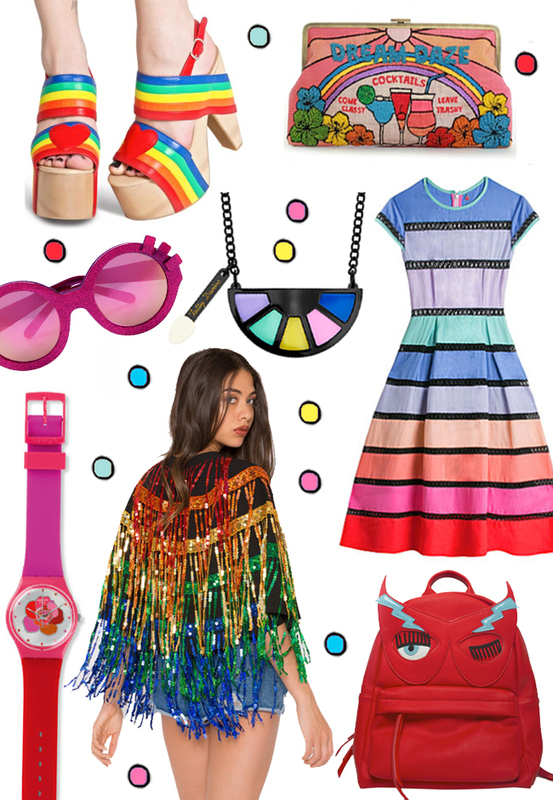 Wearing rainbow is the ultimate colour decadence: Why choosing if you can have them all? It's like meeting all of your friends together, like eating a whole cake instead of restricting yourself to a single piece. Why do other people have difficulties to decide if they want to go for marble gray or elephant gray? I just don't understand and overtake them with full rainbow power. Rainbow is not just fashion; this is a philosophy! Be inspired to wear the most colourful piece you own today and please let me know what you like best from my shopping finds.